I take my hat off to movie-makers. 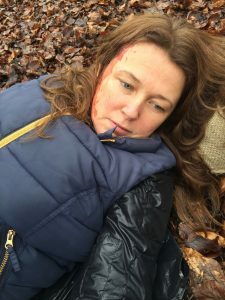 Earlier this week, a group of seven of us, occasionally swelling to fifteen, spent the entire day in the Chiltern Hills shooting footage for the video trailer of my new book, Dead Woman Walking. By the end of it, we all felt like dead women (and men) walking. It was completely exhausting. 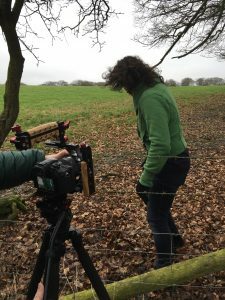 And, the day on location came on top of hours of planning, location scouting, casting, script writing, story boarding and gathering together of costumes and props. Another full day of editing will be needed to get it screen ready. The finished trailer will be approximately 90 seconds long! The simplest of actions: a CSI in Tyvec suit brushing aside the hair on a bloodied corpse, had to be shot repeatedly, from every conceivable angle, from a distance, from the middle distance, in tight frame, in close up. And this for a sequence that might last two seconds at most. How three-hour epics like Lord of the Rings get made is beyond me. But we did it, or at least we’re well on our way. 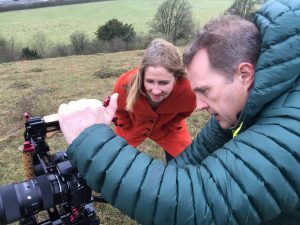 We were blessed to have a very experienced producer and cameraman calling the shots, and we have some chilling and beautifully shot footage in the bag. Fingers crossed it all comes together in the editing suite! Dead Woman Walking is out on 20 April and can be pre-ordered now. The video trailer should be ready in a couple of weeks.